This book traces the influence of English and Scottish radicalism on the United Irishmen. Stewart describes two important parallel developments in Eighteenth Century Ireland which ultimately came together in the United Irish movement. The first was the emergence of an Irish national consciousness amongst Protestants who had formed the political class ever since the Williamite settlement of the late Seventeenth Century. Imbued with the Whig principles of the English revolutions of the 1640s and 1680s, they increasingly chafed at the Irish Parliament's subordination to England. The second was the gradual re-emergence of a Catholic middle class able to challenge the penal laws. These twin developments are clearly summarised in chapter three, The Story of the Injured Lady. 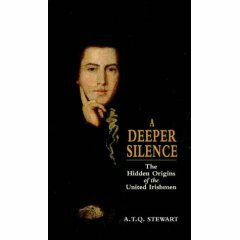 -The influence of Locke and Shaftesbury on Frances Hutcheson, a Co Down-born philosopher who played a key role in the Scottish enlightmentment. -The volunteer movement ostensibly formed as a reponse to the threat of French invasion, but which became a major force pushing for political reform. -Presbyterian support for the American Revolution. -links between Freemasons in Ireland, France and America. At the centre of this web are the Presbyterian Minister Rev Thomas Drennan and his son William, one of the founders of the United Irishmen. With the Helot Letters Drennan makes the most open statement of his radicalism on the reform question and appears to part company with the Whigs and even with the Commonwealthmen. The only hope for the reform of Parliament lies in the Volunteers and their ability to over-awe it in the name of the people's rights; and Drennan deliberately turns from constitutional politics to a doctrine which preaches the unity of all Irishmen in a common patriotism. This is, in one way, an older sense of Irish identity and one which will become paramount after 1800, the patriotism of Catholic Ireland. He is perhaps the first republican to embrace it. There is much in the book that has a contemporary resonance. Particularly interesting in this regard is chapter seven, The Edicts of Another Assembly, which describes an episode in 1783 when the National Convention of Volunteers tried to pressurise the Irish Parliament into adopting a plan of reform. The issues of legitimacy raised by this event have recurred many times in subsequent Irish history. However, the Protestant provenance of the volunteer movement invites another comparison, the similar attempts by elements of the New Model Army to impose a written constitution on the English Parliament at the end of the Civil War in the 1640s. It maybe that the kernel of the story uncovered here is how the influence of the English democratic tradition revitalised Irish nationalism after the defeat of Jacobite loyalism. I can't help wondering if it is now England itself which needs to recover that tradition as it faces it's own crisis of identity.